Lock in a great price for Hotel Zarauz – rated 8.1 by recent guests! Very close to the beach, 3 min walk. I slept in a clean room, what you would expect from a hotel like this. Friendly and professional staff. Free parking in the back. So that was all quite satisfactory. Super comfortable, spacious, friendly. Great stay! We would definitely recommend and will return! Looked a bit nondescript from the street, but inside it is cozy and warm. Reception staff great and spoke very good English. Helpful. Nice comfy lounging area off the reception, conducive to meeting others or just settling in with a good book. Rooms are tiny, but very well appointed. Bed super comfy. All facilities are very clean! Nicely located with very friendly staff. Good bed. It is a normal, old school hotel. Nothing really good, expect perhaps the lobby and nothing too bad. Great value for the price! We booked a room for 3 people last minute and it turned out to be our own little apartment with a beautiful view, 2 rooms, 4 beds and a private bathroom. The price was so low we even had to wonder there might be an error. Everything was clean and super comfy! Absolutely recommend! I really liked the hotel, room was perfectly cleaned, fully equipped and quiet. Location is perfect 5min. from the beach. I had no problem to park there free at the weekend. People were really nice. I would recommend this place for romantic vacation just as for business trip. It´s the best option (cheapest) between Bilbao and San Sebastian. I spent 1 night there and other day I traveled to San Sebastian. Hotel Zarauz This rating is a reflection of how the property compares to the industry standard when it comes to price, facilities and services available. It's based on a self-evaluation by the property. Use this rating to help choose your stay! 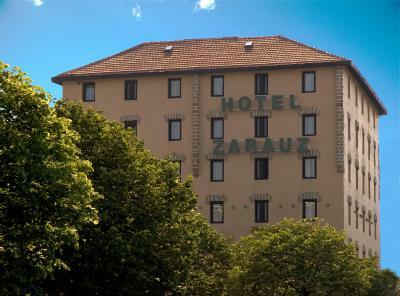 Hotel Zarauz is hotel on the Basque Coast, 9.3 mi from San Sebastian. It is only 350 feet from the beach and 1,000 feet from the Zarauz Golf Course. Free WiFi is offered throughout the property. Rooms feature a flat-screen TV and heating. The bathroom comes with bath and hairdryer. The hotel’s Santa Barbara restaurant offers a buffet breakfast, a daily set menu, and a children’s menu. It can cater for up to 200 people. Surfing is a popular activity in Zarauz, and the nearby countryside is popular for hiking. Bilbao is 50 mi away, while France is within a 20-minute drive on the nearby A-8 Motorway. When would you like to stay at Hotel Zarauz? This room can be fitted with twin beds or with a double bed. It features plasma TV, free Wi-Fi, and private bathroom with a hairdryer. Features a single bed, flat-screen TV, free Wi-Fi, and private bathroom with hairdryer. Some of these rooms are interior-facing. The Family Room consists of 2 connecting Double Rooms, both of them fitted with twin beds. It features a private bathroom with a hairdryer, flat-screen TV and free Wi-Fi. Please note that the hotel considers guests as children if they are under 8 years old. 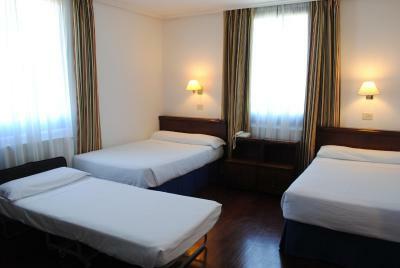 This room features a double bed and a single bed, free Wi-Fi, and private bathroom with a hairdryer. This room features a double bed and a single bed, flat-screen TV, free Wi-Fi, and private bathroom with a hairdryer. 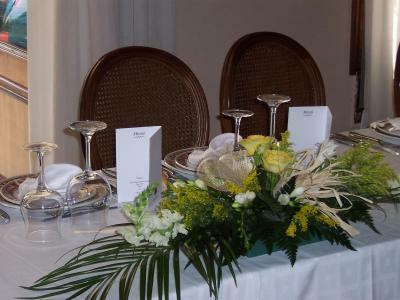 Hotel Zarauz, with a privileged location, near to the beach, with a good maintenance and cleanliness, today, offers a hot and attentive service adapted to the needs of the clientes that allows to know Zarautz and the surroundings all the year. House Rules Hotel Zarauz takes special requests – add in the next step! Hotel Zarauz accepts these cards and reserves the right to temporarily hold an amount prior to arrival. Nothing in particular, it is a bit away from the center, where the bars and the beach is, but still you can easily walk. It could be a bit cheaper and the stuff could give you some piece of advice regarding the city. Excellent place to stay. Short walk to beach. Restaurant menu used to have better fish options for us (as non-meat-eaters); was only a few fries whitebait or a ratatouille with fish flakes in it. The salad was excellent. The lasagne was rather microwaved industrial style (at least a quick flash grill to brown it on top would have done the trick). The service however was very friendly and efficient, and the wine was fine. Rather noisy from the lift mechanics (but we had requested top floor so most won't notice this). Room service was poor and only 2 meals came and had to go down twice to get other meals sorted. The evening set meal was great value. Car parking was good. Will stay again at every chance when passing. Car parking was an issue. I had to pay a fine. 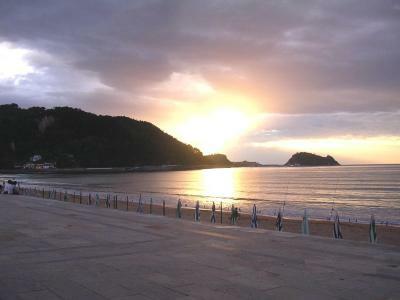 Hotel Zarautz is in an ideal situation close to both town and beach with free (non bookable) parking. It is great value for money and is ideal as a stop over or for longer stays in the summer. 24h check in with friendly staff. Good secure parking. Floors were a little creaky and the bed springs noisy, other than those minor quibbles everything was fine for a three star budget hotel. Stayed here many times before and so knew what to expect. The hotel is very conveniently situated for town and the beach; two minutes walk to the beach about five minutes walk into the town. Off road parking is a bonus. Room was very clean, as always and the Reception staff were very attentive and helpful. The restaurant was packed on Saturday night which is always a good sign though the fixed price for a good four course dinner surely helps. I always to look for a deal on the Hotel Zarautz and it's my first choice for a stay in the area. My pic shows a T bone steak from Txiki Polit restaurant. The Gure Txokoa restaurant (where we originally intended to dine) was closed and their price for a similar dish was 14 Euros more expensive than that shown on their web-site. The Txiki Polit was a great choice and judging by the clientele, the citizens of Zarautz would agree. Room was very dark, needs to be modernised and next to a gym where people trained from early morning to late at night. Noisy. Hotel was in good location a few meters from the beach, near all amenities and off road parking. They could upgrade the decoration. I liked that everything was super clean and the stuff is very friendly.